Mix first 4 ingredients and put in a greased pie pan. Brown ground beef and onion, draining off fat. Add spaghetti sauce and mix well. 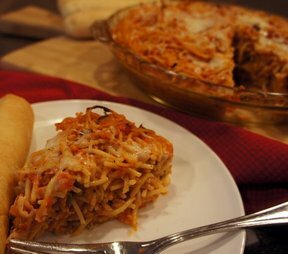 Layer cottage cheese in pie shell, then hamburger/spaghetti sauce mixture. Bake at 350 degrees for 20 minutes then add mozzarella cheese and cook for 10 mins or until shell is set and remaining ingredients are hot and bubbly.